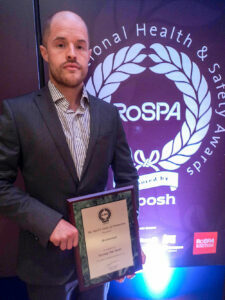 ‘Rigger lifts top safety award!’ Tom Wigglesworth, advanced craftsman rigger and Representative for Employee Safety currently working on the Drax Mills maintenance contract received the ‘Order of Distinction’ from RoSPA at their annual awards ceremony at the Hilton Metropole Hotel, NEC Birmingham recently. He normally removes mill tops on site but was more than happy to represent all TEi employees by accepting this award on their behalf for 21 consecutive years of excellence in health and safety management. Congratulations to all who contributed!